Our commitment to QUALITY is the corner stone to our ability to exceed the expectations of our customers. By consistently providing solutions based on software products that meet their business challenges and functional requirements, supporting them in a timely, professional manner and involving them in future product directions and improvement decisions. EMD Systems strives to make a rewarding work environment by involving all staff in the success of the business through quality objectives: we cultivate commercial awareness by understanding how quality at all levels impacts on business performance before, during and after the full solution and software development life-cycle. 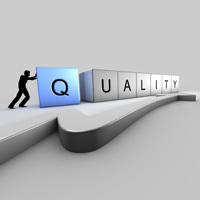 Our commitment to quality is unparalleled in the software development industry. We have developed a quality management system that ensures we are delivering premium products to our customers. It has also set the ground work for our ISO 9001:2008 compliance and inevitable certification. We take a process-oriented approach during the development, implementation, and continuous improvement of the quality management systems we use to meet our customers' exact requirements. Serving clients in a regulated industry necessitates the adherence to strictest quality standards. The quality initiative begins with an enterprise-wide quality framework designed to align our software development and service delivery to ensure quality results. Our approach to software quality realigns quality assurance testing from the end of the software development life-cycle and integrates an iterative test process throughout the software development life-cycle (SDLC). © 2013 EMD Systems Software Private Limited. All rights reserved.